That was the question repeatedly going through the mind of Dr Nick Higgs as he sat on board the vessel at the centre of one of the most innovative British marine research projects in recent memory. With a nine-metre whale carcass in tow, and a television crew with two celebrity presenters on board, the only thing missing from ITV’s new documentary, Britain’s Sharks, was the guests of honour. As anyone who watched the final documentary over the Easter holiday, Britain’s Sharks was ultimately a resounding success in capturing on film for the very first time how whales are ‘recycled’ by the marine ecosystem in our waters. But the story of how the programme came into being in the first place is of no less interest, particularly in the sphere of science communication. Nick joined the University in January 2013, not long after completing a PhD at the University of Leeds and the Natural History Museum, and the opportunity to be part of the documentary came his way via his former supervisor in London. Big Wave TV, which has a track record of filming nature documentaries, was offering to take care of all of the logistics, including the freezing of the animal, and had already developed links with whale stranding groups. They had also obtained agreement-in-principle from the ‘Receiver of Wrecks’ at the Natural History Museum, an historic position with authority vested in it to oversee the Crown’s interest in certain maritime affairs. With a filming window of summer 2014 identified to meet the schedules of Ben Fogle and Ellie Harrison, the wait began for a whale to wash up that was suitable for the experiment – neither too large nor too small, and sufficiently intact. But despite an average of seven whales being washed up every year, the rest of the year would yield nothing. It was not until July 2015, when a nine-metre humpback whale died after becoming entangled in fishing gear in Scottish waters, that the programme-makers were able to give the green light. At the end of August, Nick boarded the research vessel at Yelland Quay, near Bideford, and the crew set off, towing the whale behind them. They got to Lundy the next day and were forced to stay there due to the bad weather. And it was at this moment that a very different story hit the media. 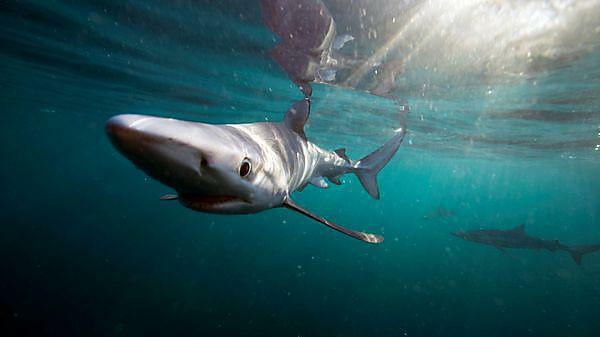 The following day, the team reached the Celtic Deeps, 35 miles off the coast of Cornwall, and that was when the blue sharks began to show up. In total, the team estimate that over the course of the next four days, 200 sharks consumed 15 per cent of the whale, ingesting some two million calories. With a storm fast approaching, the crew had to sink the whale into the deeps, and it came to rest 86m down, with a camera for company. When Nick revisited the site six months later, he was amazed by what he found. Nick is now studying the footage taken from the cameras, both of the sharks at the surface and the crabs that picked at the corpse below. An academic paper, written with fellow consultant on the documentary, Richard Pierce, of the Shark Trust, will follow.